1) The development of Agricultural Land Market is unique in Russia compared to other countries. Our Russian Colleagues have developed a new method for calculating the value of agricultural land because the banks have not accepted the cadastral value as a basis for Agricultural Land Mortgages. This value was calculated on the basis of the Land Market Auction Price Model of a certain Region. Key words: Agricultural Land Market, Russian Federation. Development of Agricultural Land Market is unique in Russia as compared to other countries. The super goal of modern Russian Agrarian and Land Reform is to create the conditions and incentives to provide sustainable development of agricultural production and to solve the country's food problem. The state’s land monopoly in Russia was abolished and two main forms of land ownership: public uses and private farming were introduced. Land may be converted into individual private property of citizens for personal use, farming, horticulture, and animal husbandry as well as to accommodate buildings and constructions for individual enterprise, to build and maintain dwelling houses, country cottages, garages. In 2001, the Land Code based on market economy principles was adopted by the Russian Parliament. The Agricultural Land Market Act was introduced in February 2003. According to the Law any parcel of agricultural land may be sold or purchased. As a result the number of Agricultural Land Market Transactions has been increased. However, the total agricultural land area has been reduced. On July 24, 2007 the State Real Estate Cadastre Act was issued. According to the Law the State Real Estate Cadastre was introduced on March 1, 2008. The Law governs the Real Estate Cadastre Survey Activities as well as collection, processing and usage of Real Estate Cadastre Information. On December 29, 2010 the Agricultural Land Market Act was amended to stimulate land consolidation as well as development of agricultural production in the Russian Federation. Development of Agricultural Land Market in Russian Federation is mostly depended on Regional Land Policies. One of the successful examples based on legal framework included the Federal Legislation as well as a local regulation is Orel Region Land Policy. In that sense it’s very important to make land cadastre information more understandable and transparent for customers. It must be pointed out that cadastral value of agricultural land is not applicable for Agricultural Land Market Transactions because there is no relation to market land value. As a result, the banks have not accepted cadastral value as a basis for Agricultural Land Mortgage Transactions. Because of it, outside investors as well as other customers have not been able to get reliable information about the value of agricultural land plots and participate as educated and well-informed agents (buyers or sellers) in Agricultural Land Market Transactions. Due to it the Agricultural Land Mortgage Values were calculated on the basis of Land Market Auction Price Model for Orel Region. Development of Agricultural Land Market is unique in Russia as compared to other countries. The abolition of serfdom in 1861 and Stolypin’s Reform as well as subsequent development of Agricultural Land Market undermined the communal land system. The super goal of modern Russian Agrarian and Land Reform is to create the conditions and incentives to provide sustainable development of agricultural production and to solve the country's food problem. It should be noted that one of the specific objectives of the reform is the redistribution of land from collective to private farming in order to provide rational use and protection of lands in Russia. The state’s land monopoly in Russia was abolished and two main forms of land ownership: public uses and private farming were introduced. Land may be converted into individual private property of citizens for personal use, farming, horticulture, and animal husbandry as well as to accommodate buildings and constructions for individual enterprise, to build and maintain dwelling houses, country cottages, garages. The private property may be established also as the result of the conversion of lands belonged to former collective and state farms as well as joint-stock companies including those established on the basis of state farms and other state-owned enterprises, and lands granted for collective horticultural production, animal husbandry, and collective country-house construction. The principle of independent agricultural production by land proprietors, landowners, and tenants has been secured. Any interference in their activity by state, economic or other bodies is prohibited. The economic, social, and legal basis for the organization and activity of private farms and coops on the territory of Russia has been determined. The rights of citizens to organize private farms, economic independence, assistance, state protection of their legitimate interests and the right to free cooperation have been guaranteed. It is proclaimed that a private farm should be an independent economic entity having the rights of a legal subject, which produces, processes, and sells agricultural products. Parcels of land may be leased by local authorities or citizens who are land proprietors. This was the first time in Russia of a right is available to divide and reform collective and state farmland into shares. Member of former collective farm or state farm has the right to withdraw and start up a farmstead of his own without asking for consent of collective or the management. Upon decision by local authorities, such a farmstead is granted a piece of land of a size corresponding to the farmstead member’s share in the land stock or value. A withdrawing farmer may expand his land possessions by purchase. During the reorganization of collective and state farms, these farms were broken up into smaller units and their juridical status was made consistent with legislation of the Russian Federation. The Russian Federation’s territory was amounted 1,709.8 million hectares in 2009. The most important piece of the area is agricultural land. The total agricultural land area was estimated 400.0 million hectares in 2009 or 23.4 % of the total Russian Federation area (see Table 1). 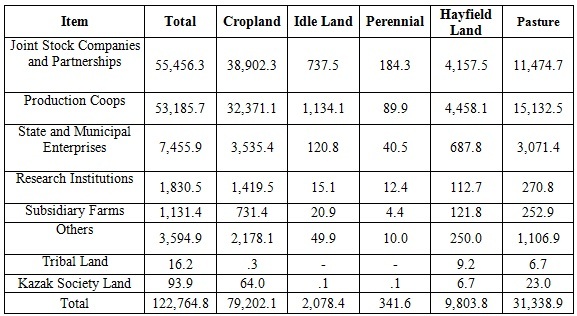 The cropland, perennial, pastures, hay field lands as well as idle land were amounted 196.1 million hectares or 49.0 % of total agricultural land area in 2009 (see Table 2). Includes: cropland, perennial, pasture, hay field land as well as idle land. The dominant role in Russian Agricultural Land Tenure has played production coops as well as joint stock companies or parastatals (see Table 3). Private farms as well as subsidiary farms have played the important role in Russian Agricultural Private Land Tenure too (see Table 4). (see Table 5). 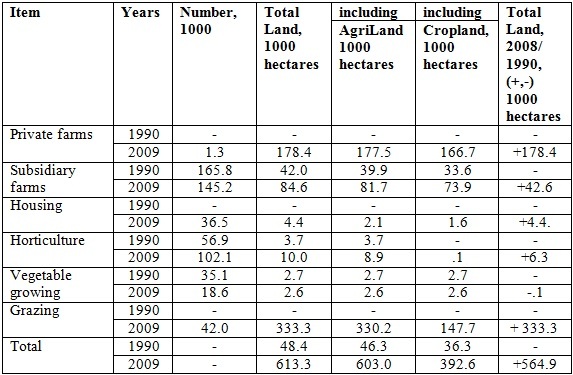 However, the total agricultural land area has been reduced (see Table 6). The average size of agricultural land occupied by private farm has been increased due to land consolidation. It was estimated 81 hectares in 2006(see Table 7). Source: Russian National Economy Fact Book 2008 (Rossija v tsifrakh, 2008) Moscow, Federal Service of State Statistics, 2008, p.238. The legal framework for Land Market must be also improved. There are some contradictions between basic legal acts (the Constitution of the Russian Federation, the Civil Code, the Land Code, The Federal Mortgage Act, the Agricultural Land Market Act, the Federal State Registration of the Rights to Real Estate Act, and etc.) related to regulation of Agricultural Land Market. Due to it, despite of adoption the Land Code as well as the Agricultural Land Market Act the legal basis for implementation of Agricultural Land Market is still unclear. Both the Russian Constitution, adopted in 1993, and the Civil Code, adopted in 1994, upholds the right to own private property, which includes both land plots and buildings. Despite these guarantees, however, land reform was for a long time the subject of national political debate. The general principles of land ownership are set out in the Constitution. Article 9 of the Constitution establishes the principle of private ownership of land. However, it does not provide any procedure for the transfer of land, historically owned by the state, into private ownership. The Land Code approved by the State Duma in 2001 has limited applicability to some categories of land, which are the subject of the separate federal laws. Such land includes water, forestland as well as agricultural land. According to the Land Code, the Agricultural Land Market Act governs the agricultural land market transactions. Thus, in fact, the Land Code applies only to non-agricultural land, which covers about just two percents of the total Russian land area. In accordance with the Agricultural Land Market Act, the Federal Mortgage Act governs the agricultural land mortgage transactions. The Farm Credit System as well as Agricultural Land Mortgage Bank must be introduced to provide an access for farmers to agricultural credit and to guarantee them the right to use their land as well as other real estate as collateral. Thus, the Russian Land and Real Estate legislation must be revised to eliminate the substantial contradictions existing between different laws now. Due to it some substantial changes have been made in Agricultural Land Market Act as well as the Federal Land Use Planning Act on July 18, 2005 by the State Duma. According to them land shares belonged to former collective and state farmers must be demarcated on the ground as well as their location must be determined. In our opinion it will positively affect on development of Agricultural Land Market in the Russian Federation. But the legislation must be amended to enable Land Market and ensure clear delineation of the corresponding property rights among the various level of the government. In 2001 the Federal Separation The State Ownership On Land Act ( Zakon o razgranichenii gosudarstvennoy sobstvennosti na zemlyou) was adopted by the State Duma. According to the Agricultural Land Market Act the Regional Agricultural Land Markets Acts were introduced at the regional level. In accordance with article 8 of the Land Code The Land Transformation Act (Zakon o perevode zemel i zemelnykh uchastkov iz odnoy kategorii v druguyou) has been adopted on December 21, 2004. According to the Law the land transformation procedure has been introduced and clarified. According to the Law the Forest Code as well as Federal Ecological Expertise Act has been changed. On January 1, 2006 the Land Taxation Act was abolished and new chapter # 31 of the Russian Tax Code “Land Taxation” was introduced. According to the chapter the Land Taxation is exclusive responsibility of local governments. In that sense it’s very important to make cadastre information more understandable and transparent for customers. It must be pointed out that so called ”cadastral value” of agricultural land using in Russia is not applicable for Agricultural Land Taxation as well as Agricultural Land Market because there is no relation to market land value. 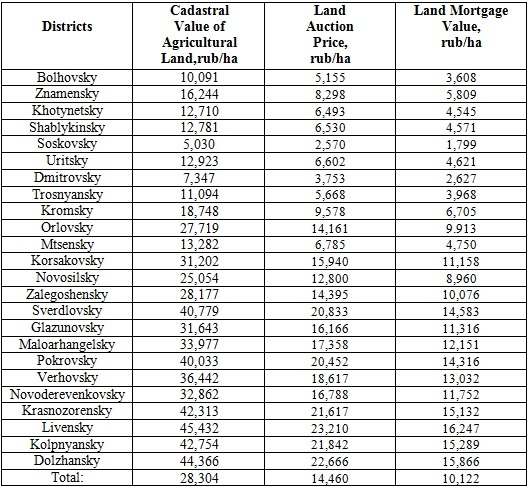 As a result, Russian banks have not accepted “cadastral value” as a basis for Agricultural Land Mortgage transactions (see Table 5).Because of it, outside investors as well as other customers are not being able to get reliable information about the value of agricultural land plots and participate as educated and well-informed market agents (buyers or sellers) in Agricultural Land Market transactions. Despite of it, a new Land Taxation System based on so called “cadastral value “was adopted by the Russian Parliament in November, 2004. According to it the maximum Agricultural Land Tax Rate defines as 0.3% of “cadastral value” of agricultural land. But a new Cadastre Value Methodology based on Market Economy principles has been developed. On July 24, 2007 the State Real Estate Cadastre Act (Zakon o gosudarstvennom kadastre nedvizhimosti) was issued. According to the Law the State Real Estate Cadastre was introduced on March 1, 2008. The Law governs the Real Estate Cadastre Survey Activities as well as collection, processing and usage of Real Estate Cadastre Information. In accordance with p.2 of article 1 of the Law the State Real Estate Cadastre is a registered record that shows the ownership, boundaries, and values of land and buildings. 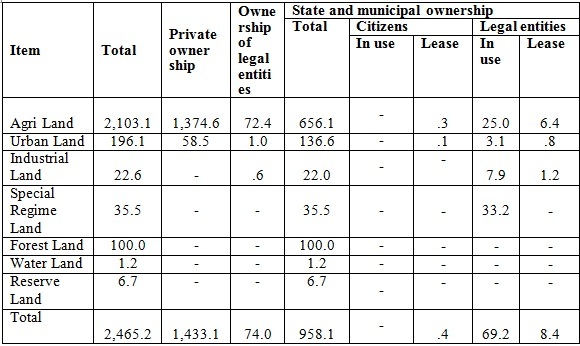 Such register shows the owner of each parcel of land, its area, its use and category, buildings as well as their fiscal assessment. In accordance with p.5 of article 1 of the Law the land plots, buildings and other property are the subjects of the Real Estate Cadastral Survey. The Agricultural Land Market Act as well as some other land acts was amended on December 29, 2010 by the special federal law #435. The order of compulsory withdrawal of sites of agricultural appointment was settled. According to the Law it’s possible through court in a case when the land isn't used 3 years and more, and also at essential decrease in fertility or considerable deterioration of ecological conditions. Signs of non-use and criteria of decrease in fertility (ecology deterioration) will be defined by the Government of the Russian Federation. Administrative responsibility for non-use of the agricultural lands to destination is strengthened. A number of amendments is directed on perfection of a turn of the land shares received at privatization of agricultural lands. So, the transfer order (without tendering) municipal sites in the property or rent to the agricultural organizations and farmers, their using is simplified. The price of such land can't exceed 15 %, and a rent - .3 % of its cadastral value. Features of formation of sites from the lands of agricultural appointment, fulfillment of transactions with land shares are established. The order of the termination of the rights to unclaimed land shares is settled. As those of what the proprietor hasn't disposed within 3 years (except those, in particular, are considered, the rights on which are registered). Possibility of disclaimer of the property on a land share is provided. The law comes into force since July, 1st, 2011, except for separate positions for which other terms of conducting in action are provided. The main objective of the Russian Government policy in the area of Real Estate is to create conditions for efficient use and development of Real Estate Market meeting the requirements of society and individual citizens. On December 25, 2008 in accordance with the President of the Russian Federation Decree on Federal Service of State Registration, Cadastre and Mapping the Federal Service of Real Estate Cadastre as well as Federal Agency of Geodesy and Mapping were dissolved. According to the Decree the Federal Registration Service was renamed into Federal Service on State Registration, Cadastre and Mapping (Rosreestr). The functions of mentioned above agencies were transferred to Rosreestr. The Federal Service on State Registration, Cadastre and Mapping is now under authority of Ministry of Economic Development (Ministerstvo ekonomicheskogo razvitiya) of the Russian Federation. At regional level local offices of former Federal Service of Real Estate Cadastre as well as Land Cadastre Chambers have been transferred to Federal Service on State Registration, Cadastre and Mapping. Development of Agricultural Land Market in the Russian Federation is mostly depended on Regional Land Policies. One of the successful examples is Orel Region Land Policy which based on legal framework included the Federal Legislation as well as local regulations. Orel Oblast Land Legislation is based on the following acts: Decree of the Head of Administration of Orel Oblast # 616 issued on December 12, 1997 on farm reorganization and land privatization and Target Program on development of the Legal Basis of Orel Oblast Land Reform approved by the regional authorities on October 10, 1998. The Land Policy is the main part of Orel Regional Government Agricultural Policy included the following components: farm reorganization and land privatization, horizontal and vertical cooperation as well as integration of agricultural producers, development of innovation and investment activities in agriculture, development of Regional Agricultural Land Market. 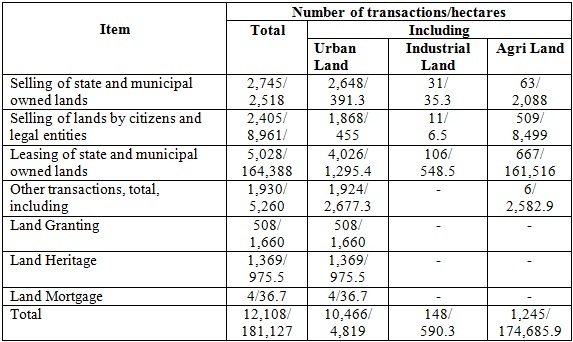 Orel region agricultural land was amounted 2,103.1 thousand hectares or 85.3 % of total regional land in 2009 (see Table 8). Break down of Orel Oblast Land is displayed in Table 9. 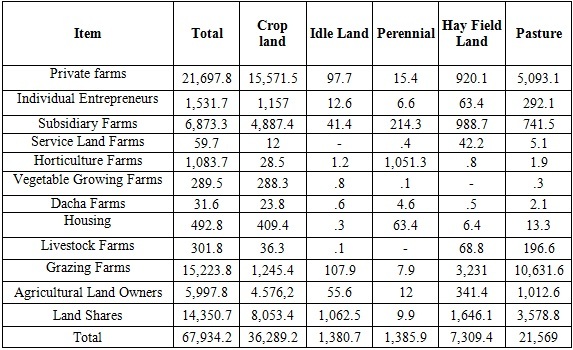 The private land ownership plays the dominant role in the regional agriculture and consists mostly of land shares belonged to former collective and state farmers (see Table 10). Main role in Orel Oblast Agricultural Land Tenure play joint stock companies and partnerships or parastatals (see Table 11). They occupied 1,264.2 (82.0 %) thousand hectares of the regional agricultural land in 2009. They have also rented the most of agricultural land shares. In 2010 there were 1,247 private farms in the region. The average size of the farm was amounted 142.3 hectares. (See Table 12). Now it’s very important to launch the public relation campaign focused on Agricultural Land Market Development to strengthen people’s ability to understand the role and importance of Agricultural Land Market transactions. Due to it the company publishes newspaper “Orlovskie zemelnie vedomosti” (Orel Land News) which provides public access to agricultural land market transactions as well as agricultural land prices information.According to article 2 of 2003 Orel Oblast Agricultural Land Market Act, all agricultural land market transactions must be executed via Orel Land Investment Company. As a result Orel Oblast Government Land Policy the efficiency of agricultural production as well as a number of agricultural land transactions has been increased in the region (see Table 13). As we mentioned before the main role in the regional Agricultural Land Tenure have played land shares. Most of land share owners have been officially registered by local authorities. The agricultural land has been consolidated by purchase or rent of property rights on land shares belonged to former collective or state farmers by private farms, parastatals and agricultural holding corporations. However, agricultural holding corporations have played the dominant role in this process. In Orel region the agricultural holding corporations mostly just rent land shares belonged to former collective or state farmers to expand production scale and increase regional agricultural production efficiency. In that case the land shares owners keep their property rights. a - Tax Adjustment Coefficient, calculated as a=R0 (1+g)/ [ R0(1+g) +V1-V0)]. V1 - Cadastral Value of Agricultural Land adjusted for Land Rent Growth, rubles per hectare. Land Rent value (R0) was calculated on the base of cadastral value of agricultural land treated as V0 and official interest rate (3%) used for determination of the value. Land Rent Growth was estimated 10%.Transaction costs are estimated as 10% too. Income Tax was taken as official income tax rate estimated as 20 %.Land Tax was estimated according to official land tax rate 0.3 % of cadastral land value. Interest Rate was taken as 15 %. In general, we can treat the Land Market Auction Price as a ratio between Land Rent and Interest Rate adjusted for income as well as land taxation. The ratio between Agricultural Land Market Auction Price and Agricultural Land Mortgage Value was taken as 70 %. In our opinion the value should be accepted both the commercial banks and the agricultural producers. Agricultural Land Market Legislation must be revised and amended both on the federal as well as the regional level. The institutional framework for implementation of Agricultural Land Market must be improved both on the federal as well as the regional level too. Agricultural Land Auctions must be introduced to stimulate development of Agricultural Land Market in the regions of the Russian Federation. The training and retraining programs related to Agricultural Land Market issues must be introduced. Real Estate Cadastre Management should be improved in accordance with market economy standards. The public relation campaign to strengthen people’s ability to understand the role and importance of Agricultural Land Market Development must be initiated. Orel Regional Land Policy or Orel Model is one of successful ways of development of Agricultural Land Market in the Russian Federation. Orel Oblast Agricultural Land Reform experience should be scrutinized and replicated in other Russian regions. Russian National Economy Fact Book 2008 (Rossija v tsifrakh, 2008) Moscow, Federal Service of State Statistics.